Place the sweater fabric between the bias tape leaving the extra inch on the top and bottom of the sweater. 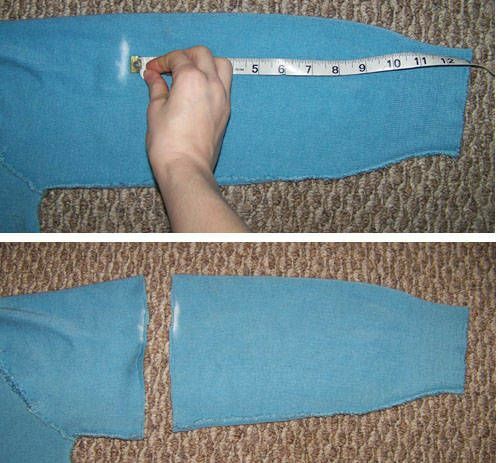 Sew the tape and the fold to the sweater using a sewing machine. Sew the tape and the fold to the sweater using a sewing machine.... sewing_green writes: Gertie is so cute in her sweater, that I had to make one for my pomeranian, Peaches! I used 2 felted wool sweaters because I didn't have enough ribbing from just one sweater. It turned out to be a nice contrast color. She looks very cute in it! The bottom hem of the shirt can actually be used to make 2 cute neckerchiefs for another dog. Just cut them apart along the sides to make two triangles. 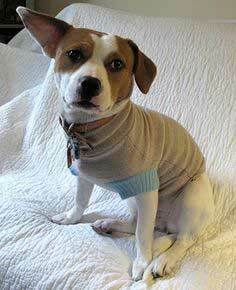 Just cut them apart along the sides to make …... Mark the sleeves of the sweater with a sewing pen at the desired length for your pet's legs. Remove the sweater and trim off the excess sweater. Use yarn or thick thread to stitch the cut edges to prevent the knit material from unraveling.